You want a cheap Xbox One? We’ve got you. It can be tricky cutting through the mountain of Black Friday deals on offer this weekend. Thank your lucky stars we’ve done it for you, then. Here are the cheapest places to buy an Xbox One on Black Friday 2016. For US readers looking for the latest model, get yourself over to Rakuten for the Xbox One S bundled with Minecraft for the ridiculous price of $219.99. If you’ve got a bit of extra cash, this Xbox One S deal with Battlefield 1 and The Elder Scrolls V: Skyrim Steelbook Edition on Amazon for just $288.99 isn’t to be sniffed at either. If you want more, or to shop around and weigh up all your options, you should bookmark this page, where we’re listing every single console and game deal happening over the Black Friday weekend. The best price in the UK is currently being offered by Amazon, with its Xbox One S 500GB Minecraft Bundle with Forza Horizon 3 for an insane £199.99. 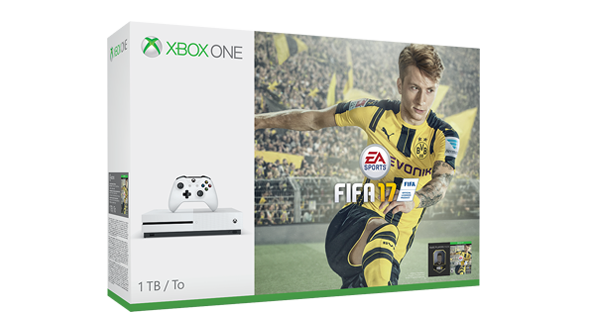 If block building isn’t your thing, there are a lot of retailers selling bundles for £229.99, and we reckon GAME’s deal of the Xbox One S with FIFA 17, Forza Horizon 3, Rise of the Tomb Raider and a Now TV Sky Cinema Pass is a tough one to beat. Remember to keep an eye on this regularly updated list to keep an eye on console and game bargains over the next few days.